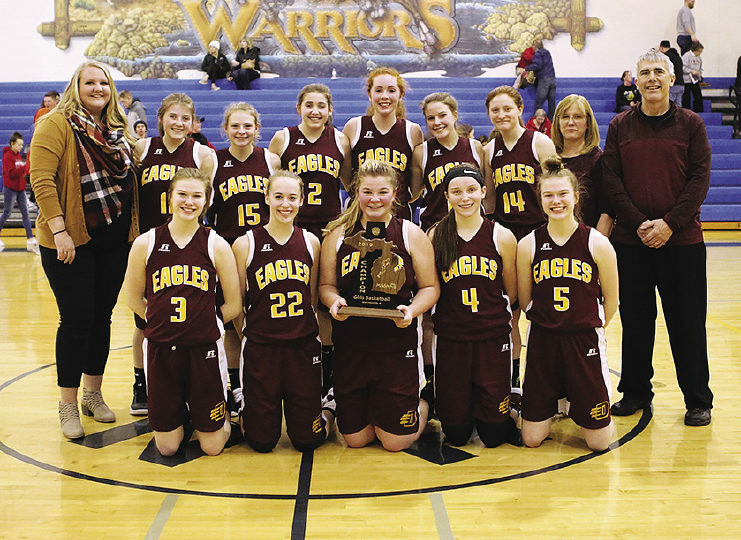 The Deckerville Lady Eagles captured a district championship on Friday night as they bested the Peck Pirates by the score of 36-31. The Eagles fell behind early but managed to cut the deficit to just a pair by halftime. Williams was high scorer for the Eagles with ten. Eagle-mates Ella. 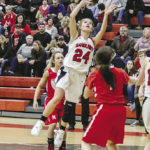 Watson and Hailey Foote added eight each, while Claire Watson had six with Emma Beaver and Morgan Armstead adding two each to round out Deckerville scoring. The Lady Eagles, now 17-5, will meet 14-8 Genesee Christian in the first round regional semifinals as they travel to Kingston on Monday night. The Lady Eagles trounced New Life Christian 49-22 on Wednesday night. Addison Williams turned in a double/double with a dominating 22 points, ten rebounds and five steals. Claire Watson added a bakers dozen 13, while Morgan Armstead and Haileigh Foote scored 8 and 6 respectively.